Worry no more about spills and stains on your floors with waterproof flooring in Belmont, NH. Our local flooring store offers waterproof flooring in appealing vinyl plank and cozy carpeting. Come into our store to talk to one of our sales and design professionals about our brands and styles of water-resistant floor coverings. Your life is just too busy to spend your day mopping up spills when the kids knock over their milk or when the puppy has an accident. With waterproof floors, you can feel confident the planks and carpeting resist liquids and make cleanup a breeze. 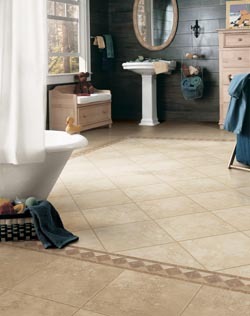 Discover brands, styles, and colors of flooring in our showroom that withstand water. Are you one of those homeowners who loves the look of hardwood floors? Despite your preferences, you are afraid of the damage that daily living would cause to your flooring. That is why our store offers waterproof luxury vinyl planks from Downs. This trusted manufacturer makes vinyl plank in an assortment of widths, appearances, and finishes that look just like the real thing. However, our waterproof vinyl flooring resists moisture. This means high-performance, low-maintenance floor coverings that work well in every room of your home, including the kitchen, bathroom, and basement. The secret lies in new manufacturing techniques that make this flooring 100 percent waterproof, so spills and stains wipe right up. This makes for flooring that is strong and durable. Expect Downs H20 to resist liquids, stains, scratches, and even mold. On the underside of the vinyl planks, there is a cork backing, so the flooring is comfortably springy and quiet. For our customers who prefer fabric flooring, we offer waterproof carpet. Tigressa, which is known for soft and durable carpeting, makes fabric flooring that resists liquids and stains. The fibers themselves are treated to repel stains and odors, while the backing does not allow water to soak through the padding to the subflooring. This means water is not trapped beneath, which could contribute to the growth of mold. Tigressa H20 is great for families with pets, as it is proof against water, children, and pet smells. Messes and accidents clean up easily, which makes your life a whole lot easier. With waterproof carpeting, you can enjoy the beauty and warmth of this flooring option and expect it to last for many years. Once you choose your flooring, ask us to schedule waterproof flooring installation at a time and day that is convenient for you. Our skilled technicians come to your home to lay the vinyl planks or carpeting for long-lasting beauty. Contact us today for expert advice in choosing the perfect waterproof flooring for your home. We proudly serve Laconia, Belmont, Gilmanton, Wolfeboro, and Moultonborough, plus most of Central New Hampshire.